After defeating the Mecha Dragon, Mega Man moves one step closer to Dr. Wily, but there's still a long way to go. He must now proceed through the interior in order to get past the early defenses. Dr Wily anticipated that Mega Man might make his way inside, so he designed this early section of the fortress with a large number of spikes. Now that you are chasing after Dr Wily, be aware that your weapon energies do not replenish from stage to stage. From now on, every weapon capsule you find is precious. Be sure not to squander them; make sure you refuel weapons that need it most, or those which you know will be important in later battles. A: There's a large weapon capsule just waiting for you at the start. As mentioned above, your weapons no long automatically refill at the start of each Dr. Wily stage unless you lose all of your lives and continue. So use this one to fill up any weapon (or item) that needs energy. Then make your way past the three section where Fly Boys drop from the ceiling. The Metal Blade can be used to cut through them very quickly. B: This is the only moment in the game where the use of Transport Item 2 is required. There's no other way to cross the sea of spikes that line the floor. Launch the item while standing on the ground; jumping up make cause the sled to appear too high, and you won't make it below the low ceiling. On the other side, there are two ladders to escape from. The second one is a bit higher and harder to reach, but the reward is worth the effort. Just be sure to jump on to one of the ladders before the sled hits the opposite wall and disappears, dumping you in the spikes. C: Assuming you manage to jump up and grab the second ladder, you'll be able to collect an E-Tank, and extra life, and several small weapon refills on your way down. When you reach the next screen below, the two Shotmen that are waiting for you may or may not be a threat, depending on how you descended. Shoot them to remove them when it's safe. Consider carefully whether you want to use Crash Bombs to open the walls that block your access to the extra life and E-Tank. If you use some Crash Bombs now, you'll have to make sure that you refill some time later. 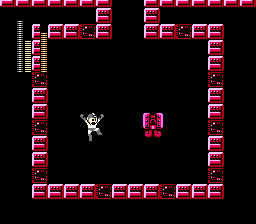 D: Much like in Metal Man's stage, you'll have to walk through a narrow corridor with a series of Mole drills flying through the floor and the ceiling. This can be an opportunity to refuel some of your weapons, but you may end up spending a lot of time just to get a little energy if your luck isn't great. The Leaf Shield can protect you from the Moles, as well as cut a path through a series of them when you throw the shield. E: After passing the first Press, you'll need to use Transport Item 1 or 3 to get up the wall and proceed below the next set of Presses. The final two Presses are placed incredibly close to one another, and you'll have to stop at just the right position in order to avoid getting hit by either of them. F: The final leg of this stage is a short drop through two screens. It's not entirely difficult as long as you are a good judge of where Mega Man will jump and fall to, but even the slightest mistake can be fatal, so pay close attention to where Mega Man is headed. Unless you are extremely low on health, it's safer to avoid the health capsule luring you over to the right side of the second screen. Instead, drop straight down the gap to reach the stage boss. After falling in through the ceiling, you arrive in what appears to be an empty chamber. Shorty after arriving, pairs of tiles along the floor and the walls will begin to converge in the center of the room to form a small floating robot called Picopico-kun. They form up one at a time, and after the combine, they float towards wherever Mega Man is standing. As soon as one is defeated, another pair of tiles merge up until fourteen Picopico-kun have been destroyed. Once you destroy one instance, situate yourself in the middle of the room and watch out for any tiles that may be coming toward you while you prepare for the next Picopico-kun. The more of them that you defeat, the faster the next one will approach you. A few weapons work against them, but the most effective weapon by far is the Bubble Lead. One Bubble Lead will destroy each robot with a single hit. As a result of the way the Bubble Lead weapon simply drops to the floor, it's recommended that you leap in the air before using it, attempting to get as high as possible before shooting. Alternatively, two shots from the Metal Man weapon will also make short work of the boss in this stage. This page was last edited on 29 August 2016, at 14:14. This page has been accessed 31,456 times.